As seen in Marie Claire. 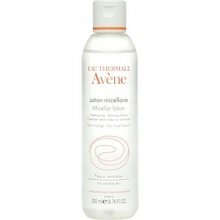 Micellar Lotion is a technologically advanced, no-rinse formula that provides gentle cleansing without harsh ingredients. Removes makeup without disturbing skin s hydration and lipid levels. Contains active ingredients which are naturally encapsulated and released upon contact with skin. Provides deep-cleansing power without irritation due to its lack of synthetic ingredients.pH-balanced for use on the eye area. Hypoallergenic, fragrance-free and noncomedogenic.